Property Location County Route 14/1 Ivy Creek Rd at Copper Head Trail. Being same property conveyed by Deed Book No. 0292, page 0606, and assessed as Tax Map No. 16, parcel 13, in 09 district Lincoln County, Wv. 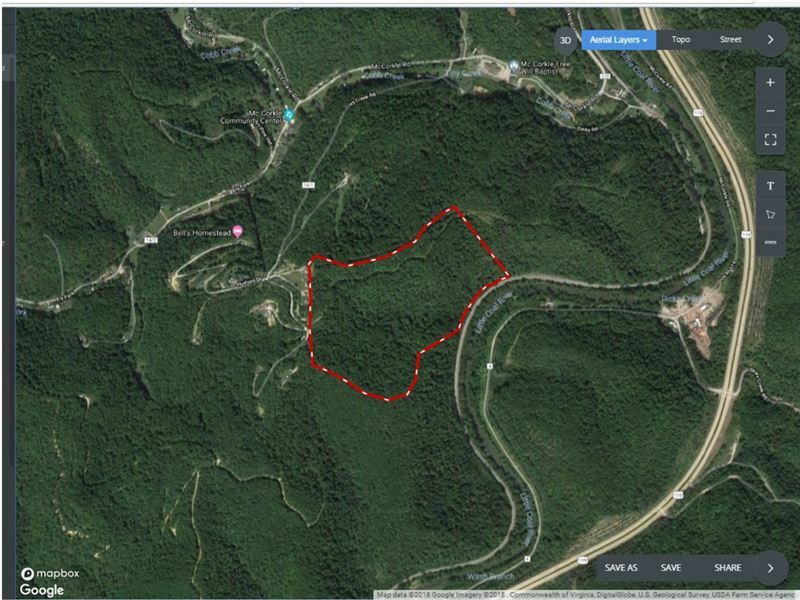 Lincoln County, West Virginia Recreational/Investment opportunity. The property is wooded hillside with many hardwood species in close proximity to the Coal River. Recreational property for outdoor enthusiasts, ideally suited for camping, hiking, 4-wheeling and hunting. Watch your investment grow with this heavily wooded parcel for future timber sales. There are no mineral rights with the property you are only purchasing the surface rights. Terms Successful Buyer required to pay a 10 non-refundable down payment day of sale with the balance due at closing, which shall occur on or before Oct. 27, 2018. There will be a 5 buyer's premium added to the final high bid price to determine total contract price. Property sells in its present As-Is condition with no warranties expressed, or implied, by sellers or auctioneer. Land features, descriptions, details, directions, sales history, photos, maps, boundaries and files are deemed reliable and provided "as is" without guarantee, warranty, representation, expressed or implied by LANDFLIP or its advertisers, and is subject to errors, omissions, sale or withdrawal. Contact the seller directly regarding this listing. Click here to email the Agent and get more information or schedule a viewing of this land.